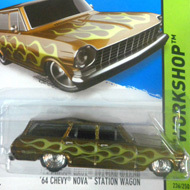 221/250 is part of the HW Workshop series and the 2014 Super Treasure Hunt set. The Twil Mill features green Spectraflame paint with a black stripe on the top. It also has green graphics and a green Hot Wheels logo. The car has clear windows, a black interior, Real Rider 5-spoke mag-style wheels with chrome rims and black spokes, and a metal Malaysia base painted green. This iconic concept car made its debut in 1969. 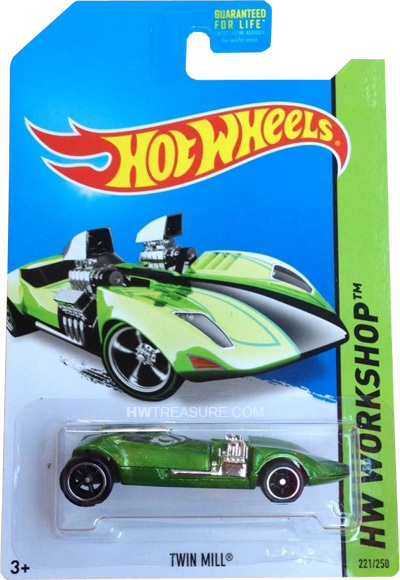 Unlike many Hot Wheels that are based upon actual vehicles, the opposite is true for the Twin Mill. A fully functional life-size replica of the die-cast car was revealed at the 2001 SEMA show.